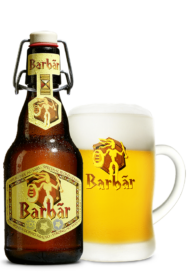 Barbãr Blonde has a deep blonde in colour, Barbãr’s creamy head gives off a powerful aroma, unobtrusively scented with honey and accompanied by a bouquet of floral, spicy and citrus notes., it has an alcohol content of 8%. The use of soft wheat gives a rounded attack, without heaviness. The sugar provided by the honey during the wort boiling undergoes fermentation and is converted into alcohol. Consequently, this is a soft but not sweet beer, with a touch of acidity which gives it freshness. The finish is full of finesse and without a bitter aftertaste. An original and distinctive beer whose distant origins go back to the “cervoise” brewed by our ancestors who called it “Warrior’s rest”.